Shortly before Remembrance Day 2012 I received a call from Derek Johnson at Meridian TV in the South of the UK. He had seen the Family Tree work I’d done for other presenters and wanted to know if I could help him with a mystery he had turned up whilst filming a piece for Remembrance Sunday. A mystery? How could Time Detectives refuse? So he settled down to tell me the story of filming in France at an exhibition of “The Missing” stories of men Missing In Action in the First World War. In one particular case two brothers had been killed by the same shell at the Battle of Delville Wood (nicknamed “Devil’s Wood” by the Tommies who fought there). He had found out that these particular brothers had never had their memorial visited by members of the family, and efforts to contact surviving family members had proved fruitless. So Derek was asking me to trace the family forwards to the present day, a change from my usual task of tracing families backwards in time. This approach brings its own problems, as detail is harder to get the nearer to the present you come, for example there is generally no access to census records less than 100 years old. The first step was to check the army records for the twins, which showed that they worked as clerks in Brighton, and were both unmarried when they joined the Royal Sussex Regiment together on the same day. As relatives had never visited the memorials it seemed unlikely that the brothers were married, but this was the next thing to check as many men married their sweethearts at the last minute before being sent to the front, and many fatherless children were the result of such marriages as the death toll at the front mounted, but in the Bindoff boys case neither had married. The military records were interesting, both signing up on 8th December 1915 at Chichester, Sussex. They were six feet tall but thin, only 9 stone (126 lbs)when they joined up. After basic training they were shipped to France, and started to write letters home describing the horrors of the trenches, during the protracted Battle of the Somme. One poignant mention of the fields littered with the bloated corpses of horses (any mention of human corpses would have been censored from their letters). So far they had been exposed to German Artillery bombardments, and had managed to come through in one piece, but their luck would change when they were taken out of their regiment and transferred to the Manchester regiment to make up numbers for a big push on the German lines that was coming. The last entry in one of their diaries was that they had been moved up to the forward trences. the next day they took part in the battle of Devil’s Wood. 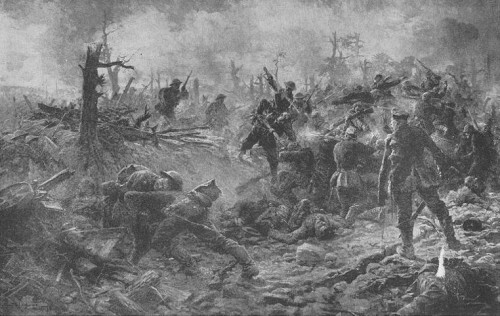 By the time the twins went into the wood, the German bombardment had been so intense that the trees were still burning despite heavy rain, the woods were full of shell holes filled with a mixture of water, mud and the corpses of Allied and German dead, the result of months on incessant fighting, much of it hand to hand. As they advanced through that nightmare landscape on 2nd September 1916, a German shell landed next to the twins according to eye witnesses, killing them instantly. Herbert was probably vaporised, Frederick blown apart. The day after they died, 3rd September 1916 the Germans were finally pushed back out of the woods. The allies had lost over 2,500 men in the Battle, the German losses are unknown. The results of the twins’ deaths were not simple for their family at home. Their Mother was a widow and had now heard that one son was dead and the other missing, enough was found of Frederick to be buried, but nothing was found of Herbert. This was further complicated by the fact that their mother had received a letter from another soldier saying that he had buried Herbert. Unfortunately it was unofficial policy to have the friends of soldiers who had died in appalling circumstances to tell the bereaved parents that they had seen their son die, and had buried their remains on the filed of battle. No doubt the intentions were noble, but in the Bindoff’s case it lead to years of agony for the twins’ Mother believing that her son Herbert’s body was lying in an unmarked grave somewhere in Delville Wood. She pursued the War Office with sad letters asking to know where his grave was. Unfortunately the truth was more dreadful. This was the reality of the situation in 1916, but in 2012 we had a different dilemma, could we finally trace the family and reveal the story to them despite the twins having no direct descendants of their own? So it was time to work backwards. next stop was the census. The name Bindoff was both a blessing and a curse as it was unusual enough to stand out in the records, but by the same token was often misspelled as Bindorf, Bindhoff, Bendoff for example. Never the less the 1911 census turned up the family living in Coventry Street Brighton, Father (who would die the same year), Mother, the twins and two sisters. So the task of looking for people descended from the twins’ sisters began. This was short-lived as one died unmarried, the other married and had two daughters of her own, who had also married, but both daughters’ lines had died out by the 1990s. We had hit the usual Genealogical brick wall, but going in the opposite direction to normal research. There was no choice but to climb back up the tree to the twins Father and his paternal family of Bindoffs. This proved fruitful as he had a younger brother who had three children; two boys and a girl, this looked promising. One of the sons’ lines ended in a marriage with no offspring, but one son and the daughter had given rise to other lines and that were still in existence. Using genealogical techniques I traced the whereabouts of the families in the present day, and made contact with the most likely branch. I guess a call from a strange cockney out of the blue, offering to fill them in on two relatives who died nearly 100 years ago, and put them on the TV sounded odd; was this a scam? What was in it for me? What did it cost? I tried to allay fears by introducing the TV Producer, but, there was no interest in taking part, we’d hit another brick wall. There was still one descendant to approach; a lady on the South Coast of England, I passed on the details to the producer to followup while I took out insurance – I climbed higher up the tree, just about as high as it was possible to go, all the way back to 1776 to the first ancestor I could find, a Bindoff who was a weaver born in Middlesex (what would now be called Central London), I then climbed back down the tree picking up families in each generation on the way down, so that if the Producer was turned down by the lady I had found, we could start to look at other branches of the family (surely someone wanted to be on the telly?). Did the story end there? No, of course not, I’d climbed the tree all the way up to 1776, and I was interested in the view from up there. So what could I see? Well the first striking fact is that the boys who had died fighting the Germans in Delville Wood, were undoubtedly of German origin themselves, and given that their earliest ancestor was settled as a weaver in London in the late 1700s there was a good chance that they had Huguenot antecedents. The Huguenots were French Protestants about 500,000 of whom fled France between the 16th and 18th centuries, especially after the various massacres of Huguenots by French Catholic forces in the various religious wars fought in the 16th century. Perhaps the largest number fled to England and brought the silk weaving trade with them, notably to London, but around 50,000 Huguenots fled to Germany in 1685. Given their German, rather than the usual French surname, the Bindorf, if indeed of Huguenot descent, most likely were descended from French Huguenots among the 50,000 who fled there in 1685, marrying into local families and inheriting German surnames. Ironically the cousin of the twins who died on the Somme would become a famous Historian who wrote studies of the Huguenots. At about the same time as this many Huguenots settled in the St Giles area of London, and this is the area that we find the oldest ancestor of the twins in the late 1700s, The area was not the most salubrious, and the Huguenots stood out for their piety and fastidiousness compared to their British neighbours in London, who had a reputation for riot, drunkenness, and debauchery. Samuel Bindoff a Silk Weaver, married to a girl of French Huguenot descent Anne Adee in St Giles Cripplegate. 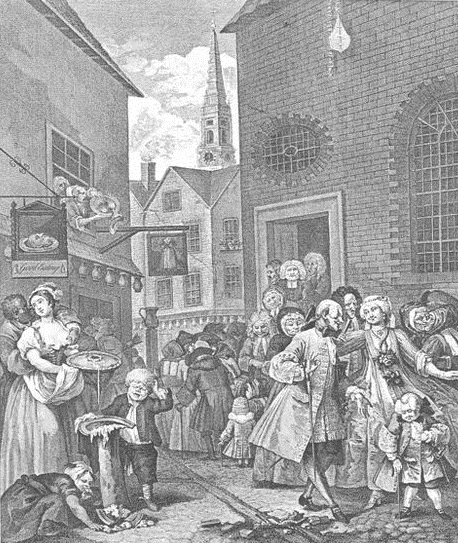 London despite its wild reputation, was a boom city in the late 1770s, and the Bindoffs had no trouble finding employment, silk was in high demand, and Samuel would have made a good living. However the silk weaving trade was starting to wain as cheap Chinese and Indian silk displaced traditional Huguenot weavers. Attempts to regulate the wages of the weavers lead to civil unrest, and Samuel and Anne had the misfortune of losing their first son George soon after birth, so times were becoming hard for the family. Samuel persisted at the weaving trade, and apprenticed his younger son in the same trade, but his eldest son also called George went into the Silver Smithing trade. George the eldest son thrived, marrying and having ten children over nearly two decades in the 1820s and 1830s in the Hoxton area of East London. Having said this, the couple had the same bad luck as George’s father, with their first son George dieing in his first year after birth. The elder sons followed in their Father’s footsteps, going into the Silver Smithing trade. And here we come upon another interesting part of the story. William Henry the third son, and Great Uncle of the twins, married Julia Wride a local girl in Haggerstone, the marriage gets off to a good start and they have two sons, Henry and William in the 1850s. However the couple separate and by 1861 William has moved to Margate in Kent where he is running a small lodging house whilst his wife stays in London with the two boys. In the lodging house with him is a woman he appears to be living with, Sarah Ayers also known as Sarah Pick or Kate Bindoff. it does look as if William has left the family permanently, and in 1863 a scandal hits William that makes the local papers. Margate (Mah-git in a cockney accent) was a seaside destination of great renown amongst working class cockneys, and with a risqué reputation. Young cockneys would take the paddle steamers down the Thames, go for a naked swim in the sea (banned in 1862), eat, drink, and dance, then stay over alone or with company in one of the many lodging houses. It seems that William, after leaving his wife and children, had taken on a small lodging house, “Pepys Cottage” in Margate, and was renting rooms to young people down in Margate for a good time. No doubt he asked few questions as long as they paid for board and lodging overnight, and didn’t disturb the neighbours. However on a warm July night in 1862, a Policeman on his rounds saw a man enter Pepys Cottage at 3 o’clock in the morning. This in itself was hardly a crime, but the Policeman with nothing better to do than harass law abiding citizens, decided to take exception, approached the house and pounded on the door until he woke up the householder, our William Bindoff. He pointed out what he had seen, and William no doubt with a degree of cockney umbrage said “So What?” or more colourful words to that effect. Put out and somewhat embarrassed by this, the Policeman forced William to let him into the house, and proceeded to search the bedrooms, where he found two unmarried young couples, one boy was so perplexed by being discovered “in flagrante” that he tried to hide under the bed, only to be unceremoniously hoisted out by the Policeman. Having rounded the occupants up, PC Plod decided to take their names addresses and details, all were found to be Londoners and unmarried. His morals outraged, the Policeman decided to charge William with running a disorderly house, in other words; a brothel. 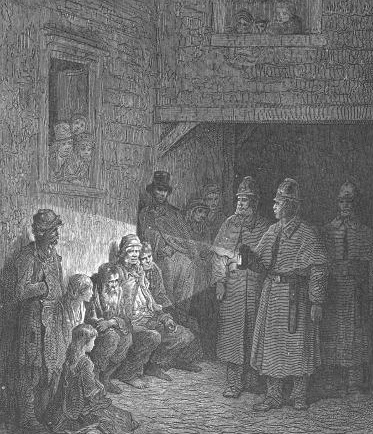 This was only the beginning of William’s downfall, hauled up before the local magistrates and with the backing of the Chief Constable, the noble burghers decide to imprison William and “Kate” to await trial, they were left to rot in Margate gaol for three months, an obvious case of a transgression of the legal principle of Habeas Corpus, whereby the state may not rob an Englishman (or woman) of their liberty without trial or evidence of a crime. Three months was actually longer than the maximum sentence for the alleged crime, and the couple hadn’t even faced trial yet. Fortunately, the local recorder of the bench, took exception to this flagrant abuse of power, and not only harangued the Police for their actions, but also pointed out that the couple hadn’t in fact committed any crime, as running a disorderly house was not a measure of immorality, but one of nuisance to neighbours, i.e. merely having consenting adults freely committing “immoral acts” in a house, was not against the law as long as they didn’t do it in the streets and frighten the horses so to speak, not only that, but the Policeman had gone way beyond his legal authority by demanding entry to the house without either seeing a crime or possessing a warrant (an Englishman’s home is his castle in common law) the Policeman had no more right to do that than any other member of the public. The grand jury hearing the case, threw it out immediately and had the prisoners released. Unfortunately the reputations of all involved were ruined, from the couples found in the house who’s details became public domain, to William and Kate who were falsely imprisoned. William was finished in Margate, shunned by polite society, and unable to find work due to a combination of lost opportunities whilst in gaol, and moral opprobrium from potential clients turning him down. William and Kate moved back to London, but he was on a downward slope, he never returned to his family, lived with Kate in Clerkenwell, but alienated from his family and carrying the smear of a gaol term and accusations of running a brothel, his ruin was complete, he eventually died homeless and destitute in Camden workhouse in 1885, in his late 50s but looking ten years older. His wife and boys do well despite William’s absence, and perhaps the shame of William’s downfall encourages the eldest boy Henry, to move away, as he became employed as a railway ticket collector, giving him the chance to move to moves to Scarborough a holiday resort on the Yorkshire coast at the other end of the country, and does well enough to be able to have his mother and younger brother William join him. His mother remarries late in life in 1883, although bigamously as William was still alive but living homeless on the streets of London, she stays in Scarborough for the rest of her life as does the younger son William. In the meantime unfortunate William’s younger brothers, twins Benjamin and Joseph (born in 1839) worked as warehouseman, before Benjamin moved to Brighton and became a leather cutter, no doubt getting into this line of work via his elder brother David who had become a Leather trader, his twin brother became a spoonmaker, probably working with the other brothers as part of the Silver Trade. Benjamin married a local girl in Hoxton, but she died within a year, and he subsequently married a girl from Sussex, and within a few years the pair had moved with their three sons from Hackney in East London to Brighton in Sussex where their fourth son was born in 1875. Their eldest son Frank Benjamin apprenticed to his father in the leather trade, then progressed to be a leather cutter in his own right, and went on to work in a leather shop in Brighton, he was the Father of the twins who died on the Somme. Bringing us back full circle to the twins who died on the Somme. I enjoyed this posting very much. The video especially the last one were very moving. Genealogy and history are not boring, and you proved that here. Thanks very much, glad you liked it. Always rewarding when you solve a mystery for relations. This is a wonderful find. My maiden name is Bindoff, in fact William Henry is my great great grandfather. His son William who moved to Scarborough and later to Kingston upon Hull is my great grandfather I have been reading my family history since I was 12 years old and actually wrote to professor Thomas Stanley Bindoff at that age. What a shame your researchers didn’t contact out branch of the family tree. We have known about the twins dying in the first world war on the same day for years. I have a very extensive family tree but didn’t know about the Huguenot connection. We have been trying to get back further than the 1700’s but not a brick well. I would love to hear from you. We always wondered why our branch of the family moved up north. Please contact me. Good to hear from you! Glad you enjoyed the research. As always with work for TV there was a time pressure, so after starting from scratch, we had to go for the nearest relatives we could find, and as it was for ITV Meridian (which operates across the South of England) it was necessary to find a relative in the TV station’s local area, and Brighton was good for that, and was an area the twins lived in. You will probably struggle to get beyond the 1700s; depending on when the twins ancestors came over from Germany/Benelux/France. The name is German in origin, and when I was first approached about the research I wasn’t sure if they wanted me to research some German soldiers or British ones :-). However there is no doubt that your ancestors were living and working with the French descended Huguenots in East London, so their immediate ancestry would be open to debate. Thanks for your prompt reply Paul. I had a look at my paper copy of the Bindoff family tree after reading your blog and added in the new info your research has uncovered. I noticed that William Henry was my 3x great grandfather, his younger son William John became father to my great grandfather who was also a William Henry and moved his family to Kingston upon Hull from Scarborough. Interestingly he also fought in World War 1 and is named in a roll of honour which is housed in the streetlife museum in Hull. I wonder if he knew his half cousins were fighting alongside him. It is fascinating to think that I may have Huguenot ancestors as I really admire that sort of bravery to stick to your beliefs despite persecution. I have found a place called Bindorf in Saxony so I wonder if they took the name from the place where they were given sanctuary. I’ll keep going with the research and hopefully try to get further back or find out why the family left Prussia and came to London. I think it’s likely that the Huguenot part of the family was on the female side and the Bindoff’s “married in”, as we know that some of the female side of the family were of French descent, and were Silk Weavers, typically Huguenot. Bindorf in Saxony could well be the Bindoff’s origin, but bear in mind that they wouldn’t have been named after their home village while they lived there, they would have been called “Fritz from Bindorf” AFTER they left the village, you don’t get called by a local name by other people in the same locality, you take the name to differentiate you in a new locality. This is virtually always the case. As a clue, the largest influx of Germans to England, and specifically London since the Saxons came over in the Roman period was the “Poor Palatines” who fled a French invasion of Western German states and were encouraged to enter England by Queen Anne (a la Mrs Merkel) to help colonise the American Colonies with hard working protestants who would be loyal to the British crown and fight the French in New England (many in the New York area) , in a fact a number were shipped over in barges by John Churchill, England’s greatest general of the age. A number liked London and stayed (including, possibly, the ancestors of the Kray Twins, see my other blog entries). The Bindoffs may have been part of this movement. Good luck with your research. I’d suggest looking in the Parish registers for the various German denomination Churches in East London and the City.